We will manage your AirBnB, VRBO, Homeaway or other online listing 24/7 plus offer a dedicated phone number for your rentals and sales. We handle all guest communications, booking requests, inquiries, and more! We respond to all inquiries in under an hour and can handle email, phone, or direct responses inside your rental listing dashboard, 24 hours a day, 7 days a week. We also handle the back-end of your business. We coordinate the cleanings and the key exchanges. We can call your manager if there is an issue, or arrange for a plumber or locksmith to come in case there is a problem. We got you covered! We review and optimize your listing to get you more bookings. We respond faster than most other hosts can manage, 24 hours a day, 7 days a week! Usually, the booking goes to the host who responds first, and that can be you! Increase your revenue per unit and your price per booking by constantly ranking near the top of the search results and by getting better reviews from your guests. Increase guest satisfaction and your listing rating because guests are always able to get in touch with our highly trained customer service staff. Stay in as much control as you like. You still maintain access to all your accounts, and can communicate with guests as much or little as you like. Increase your response rate dramatically due to no missed responses because you were sleeping, at work, at the grocery store etc. Higher response rate = more bookings! Sync ALL your accounts! No more outdated calendars from multiple listing sites. We can sync your Airbnb, VRBO, Homeaway, Tripadvisor, etc calendars so they are up to date ALL the time. Optimize your profile and pricing with our 10 point profile review as well as dynamic pricing. With dynamic pricing, we can adjust your pricing based on seasons, availability, and more! 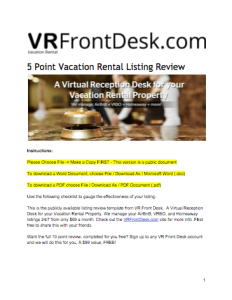 I am glad I found VRfrontdesk to help me with my property management of my short term vacation rental. They free up hours of my day with handling bookings, cleanings, client communication, and key exchange. I shopped around for a reliable property manager and after trying other short term rental property managers I am glad I found VRfrontdesk. Besides the quick responses (within what seems like an hour if not minutes) to both guest bookings and any questions or requests that I have, they were really easy to get set up with. They provided the templates of what will be sent to guests for both pre and post check in and then allow you to edit the templates as you see fit. Any hosts looking for a great property manager should give VRfrontdesk a try. VR Frontdesk gives me the piece of mind to know that the online responsibilities associated with managing my short terms rentals is handled. The VRFrontdesk team is constantly striving to satisfy and improve. Thanks guys! Sign-up to receive our 5 part listing review template instantly! 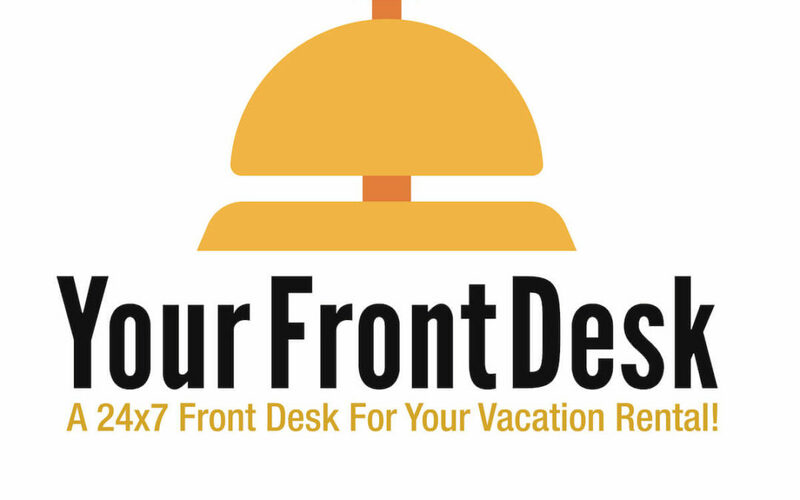 How is VR Front Desk Different? We offer options for all types of owners, from 1 to 100+ units! We only bill you a percentage based on the the reservations that we manage. We use a pretty simple system here at VR Front Desk: Trained people that care about your rental and treat it as if it was their own, combined with detailed checklists. We take the same approach that reduced mortality rates by 10% in ICU’s nationwide : checklists that must be used each time. We won’t miss any important email, we won’t miss a response that could damage your rating on your vacation site, etc. Other management companies assign your guest inquiries to whoever happens to be taking calls or responding to emails at that time. Sometimes, that can be a different person hour to hour, or even 15 minutes later. At VR Front Desk, we have different people answering the phone at different times of day and night (nobody can stay up for 24 hours), but we have a single point of contact for questions about your account or to escalate any issues if you have a problem. Signup and update your listing site with your VRfrontdesk.com email address and phone number. We then complete a short onboarding interview to make sure we understand your requirements and listing details. Whenever a guest calls, asks a question, or sends a booking request, both you and VRfrontdesk get the inquiry. You can still login and manage your account however and whenever you like. We follow your detailed instructions received during your entrance interview, screen guests according to your wishes, and coordinate key exchange, cleanings, and other issues as they arise: 24 hours a day, 7 days a week! 7 Day Free Trial! We deliver the best Vacation Rental customer service experience in the world, and we stand behind that 100%. Go ahead and Try it FREE for 7 days, and if you aren’t happy, you pay nothing! We support listings in any country. Since our front desk staff are virtual and work 24 hours a day, 7 days a week, we can handle accounts in any country and or timezone. As of now, we only support English. We can try to translate questions using Google Translate if you wish, or forward non-english queries directly to you. Is there a minimum number of days or bookings required to use your service? Nope, we offer different plans based on usage, so if you only want to use this service occasionally, we have a plan for you. Can you drop off keys in person for me? Unfortunately, we cannot since we solely an internet based service. However, we can coordinate dropoffs with your trusted key-person, or coordinate the usage of a lockbox or other service as you prefer. Do you handle the cleanings? Yes, we can arrange your cleanings, although we don’t do them for you since we are only online. If you have a cleaner you love, we will arrange scehduling directly with them as we get bookings, so you don’t have to do a thing! If you are looking for a cleaner, we can help you find one. We are working on one now! If you are interested, please contact us and we can fill you in on the details. Can I still use my AirBnB account as a traveler? Sure! You still have full access to your accounts, and can use any / all the functions you wish. Can I update the calendar myself? Sure, you have full account access, so you can update your calendar or listing at any time! What is a dedicated phone number? You can get a dedicated phone number (USA number included with VIP plan, international numbers available for additional fee) that our agents can answer as your business. Agents will pick up the phone will a greeting such as “Welcome to Aloha Vacation Rentals, how can I help you” which really helps your business stand out and be professional. Of course! Check out our plans. Each listing will need its own plan. If you have more than 5 listings and are interested in a bulk discount, let us know and we can get you a great deal! Once you select a plan and submit your payment information, an account specialist will be in touch with you within 24 hours to conduct an on-boarding interview. We will ask you about your screening criteria, booking requirements, cleaners, key exchange method, etc, so please have that info ready. We will walk you through each step of the process so we can handle your unit just like you would! What listing sites do you handle? Unlike other services, we can handle ALL the major listing sites: AirBnB, VRBO, Homeaway, Tripadvisor, Flipkey, and more. If you are using one not on this list, contact us and I bet we can manage it for you once we look into it! Do you Sync Calendars across multiple site? Of course! If you have a plan that supports it, all your calendars will ALWAYS be in sync. Do you comply with AirBnb or other sites Terms and Conditions? Yes! We act as your agent, and are fully in compliance with all major listing sites. What happens if I cancel your service? Well, we will be sad to see you go! Outside of that, all you need to do is change your email and phone number to your own services, and thats it. Since you always had control over you account, nothing else changes. Yes, we believe we have the best product and support out there. If for any reason you aren’t happy, just let us know. We offer a 7 day trial, no questions asked try us for 7 days and pay nothing! Sign-up to receive our 5 part listing review template instantly.